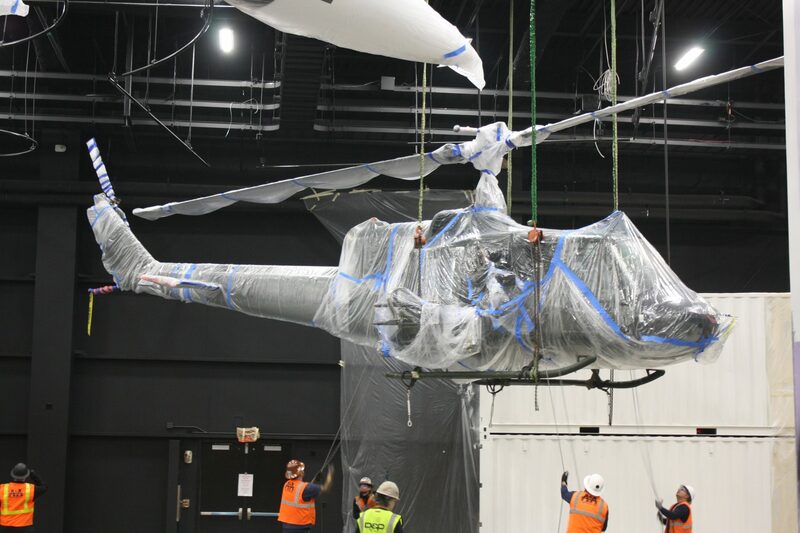 Two historic rotary wing aircraft—a World War II R-4B called “The Sikorsky” after its designer Igor Sikorsky, and a Vietnam-era UH-1B Iroquois commonly known as the “Huey”—were the latest macro artifacts installed in the National Museum of the United States Army. Considered the forerunner of today’s rotary wing aircraft, “The Sikorsky” was the Army’s first operational helicopter and the first helicopter in the world to be mass-produced. It is being showcased in the “Innovation and Invention” section of the Army and Society Gallery. The two-seat aircraft is constructed of fabric and metal and has a single engine, dual controls, three-bladed main rotor, and main landing gear and tail wheel. 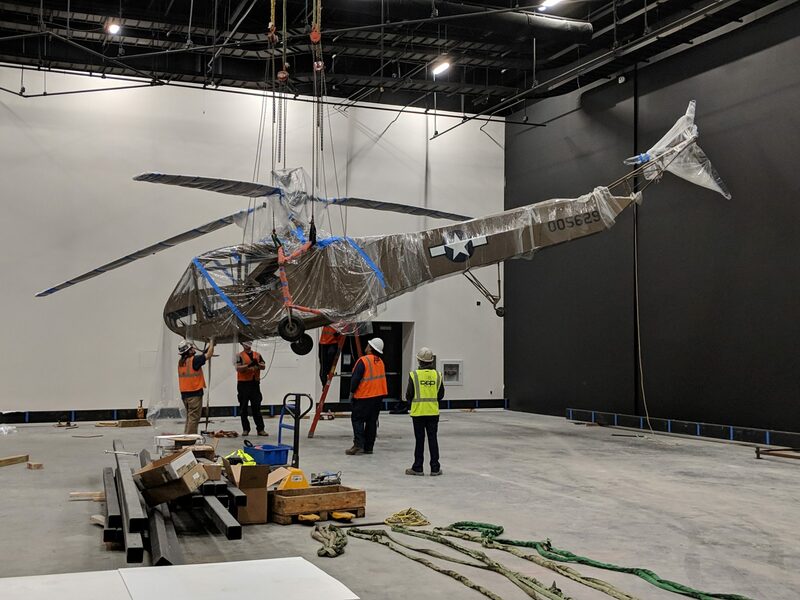 “The Sikorsky” and a replica of the 1908 Wright Flyer that will be displayed nearby in the Army and Society Gallery are a perfect fit for this area of the Museum. Both are just as much a part of American history as they are part of Army history,” remarked Brigadier General Creighton W. Abrams, Jr. (USA-Ret. ), the Army Historical Foundation’s (AHF’s) Executive Director, during installation of the R-4B. “The Army and Society Gallery, tells the story of the Army and the relationship to the country it serves. The Army led the way in aviation advancements, and “The Sikorsky” and the 1908 Wright Flyer tell that story,“ Abrams added. According to Patrick Jennings, the Museum’s Chief of Education and Programs, this R-4B is one of the few remaining of this model. It has been restored with the markings of the R-4B flown by Army Lieutenant Carter Harman of the 1st Air Commando Group during the first combat rescue mission via helicopter. Harman lifted a downed airman and wounded troops from enemy-held territory in Burma in 1944. Hueys deployed initially to Vietnam in 1962 and flew a variety of missions, to include air assault, cargo transport, search and rescue, electronic warfare, and ground attack. 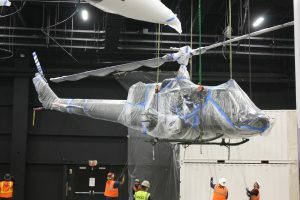 The UH-1B that now hovers above what will be the Vietnam section of the Cold War Gallery is displayed with cast figures— pilot, co-pilot, and door gunner. Equipped to provide fire support with rockets and machine guns for assault helicopters, ground troops, and motor convoys, the aircraft was flown by the “Cobras, ”members of the gun platoon of the 129th Aviation Company, 10th Combat Aviation Battalion. The aircraft encountered and survived several combat damage incidents during its eight years’ service (1965-1973) before being returned to the United States.